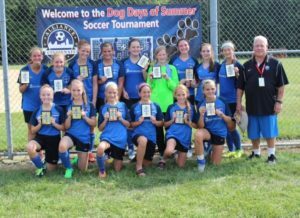 CSC 04 Girls – 2017 Dog Days of Summer Tournament Undefeated Champions! The CSC 04 Girls Blue kicked off their fall season successfully at The Dog Days of Summer Tournament in Milford Ohio, August 18-20, 2017. They finished the tournament undefeated, winning 3-1 over MSSC Impact GFC Yellow, 8-0 over Impact Middle Town Madeira, and 4-1 over Cincinnati United Barcelona. They went on to take the 1-0 victory over a very tough Ohio Fusion team for the championship. Eight different girls shared the scoring duties for CSC. Congratulations to the CSC 04 Girls Blue and Coach Cliff Tappel for bringing home the championship!